Land patents issued by the United States General Land Office to Albert O. Baldwin, William O. Alphin, Nora B. Asher, Samuel Bayne, James R. Blades, William H. Blood, John W. Brownlee, Robert L. Butts, Martha A. Davidson, Erving M. Davis, Chesley W. Jones, A. B. Montgomery, Seymour S. Rogers, Ada E. Scates, Isaac D. Smith, James Smith, Herbert H. Springer, George H. Storch, John Sheppard, and Alfred O. Yeatman. 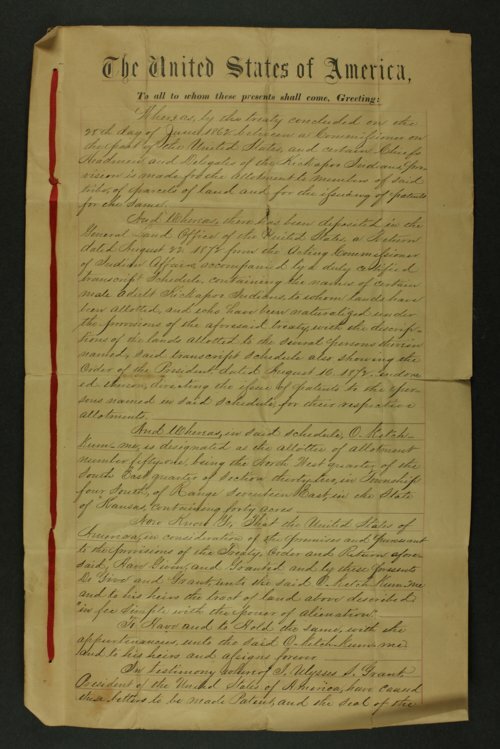 Also included is a declaration from the federal government, referencing the June 28, 1862 treaty that established the Kickapoo Indian Reservation, which grants O-Ketch-Kum-Me a designated forty acres. Government and Politics - Federal Government - Presidents - Grant, Ulysses S.